The Riigikogu approved with 77 votes in favour the Act on Amendments to the Planning Act and the Environmental Impact Assessment and Environmental Management System Act (411 SE), initiated by the Economic Affairs Committee, which enables the authorities that organise planning work to enter into a contract to cover the costs of the commissioning of the preparation of a spatial plan and impact assessment, including the strategic environmental assessment, with the party interested in the preparation of the spatial plan. The authority arranging the preparation of a spatial plan may enter into a contract for the commissioning of the preparation of the spatial plan, as well as for the covering of the costs of impact assessment, with the interested party, regarding the spatial plans that serve as the basis for the preparation of building design documentation (national designated spatial plan, local government designated spatial plan and detailed spatial plan). The authority arranging the preparation of a spatial plan may agree with the party interested in the preparation of the spatial plan that the arranging authority carries out all acts necessary for the preparation of the spatial plan – the carrying out of procurements, the planning proceedings, disclosure and approval –, but the interested party covers the costs related to the preparation of the spatial plan and impact assessment. The amendments enable to implement development projects regardless of the financial resources of the authority that organises the planning work. Meelis Mälberg, who took the floor in the debate, noted that a speedy planning process that takes into account all impacts contributes to making an investment decision. In his words, it is reasonable that interested parties participate in bearing the costs. The Bill on Amendments to the Railways Act and the Public Transport Act (398 SE), initiated by the Economic Affairs Committee, passed the second reading. The Draft Resolution of the Riigikogu “Approval of “The Fundamentals of Earth’s Crust Policy until 2050”” (410 OE), submitted by the Government. The Fundamentals of Earth’s Crust Policy until 2050 set the goal of using the earth’s crust and its natural resources in a manner that creates the greatest value for the Estonian society, taking into account environmental, socio-economic, geological and security aspects. Estonia’s long-term goal in regard to the earth’s crust is to ensure knowledge-based, environmentally clean management and use of earth’s crust resources that is directed at the promotion of economic growth of the state, by increasing resource-efficiency and reducing dependence on raw material. At the same time it is important to reduce dependence on non-renewable natural resources. The Bill on the Ratification of Protocol No. 16 to the Convention for the Protection of Human Rights and Fundamental Freedoms (408 SE), initiated by the Government. The purpose of the Convention is to enhance interaction between the European Court of Human Rights (ECtHR) and national courts, and thereby to better protect human rights and fundamental freedoms in Europe. The Protocol creates a new procedure that enables national highest courts to seek from the ECtHR advisory opinions on questions of principle relating to the interpretation or application of the Convention in the context of a case pending before a court or tribunal. The Bill declares that the Supreme Court is the highest court in Estonia who may request the ECtHR to give advisory opinions. 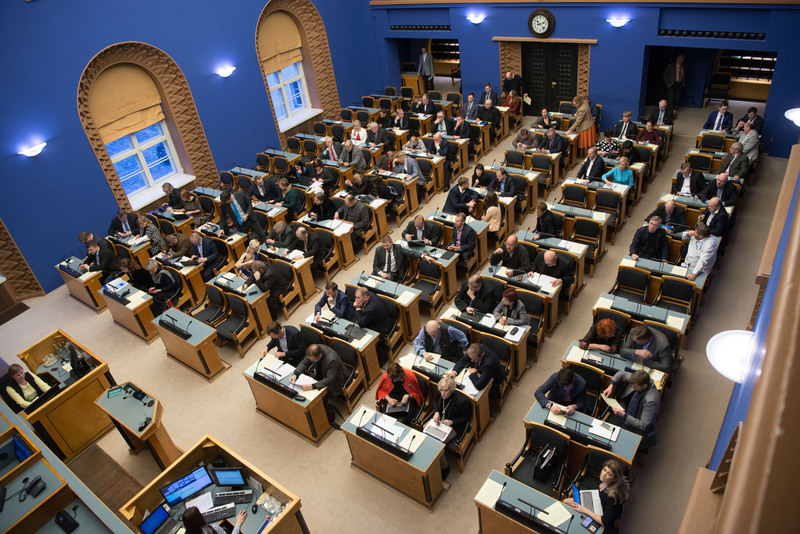 The Estonian Conservative People’s Party Faction moved to reject the Bill at the first reading. The result of voting: 7 in favour, 41 against. The motion was not supported. The Bill on Amendments to the Law of Property Act Implementation Act and Other Acts (change to payment for tolerating utility networks) (405 SE), initiated by the Government, will solve the most urgent problems related to the payment for tolerating utility networks by providing for clear coefficients for calculating the payment for toleration and a greater payment for toleration to the most burdened landowners. The Bill fixes the payment for tolerating utility networks at 7.5 per cent of the taxable value of the land under the construction, and fixes coefficients for determining the extent of the restriction on the use of land; the final amount of the payment for tolerating utility networks will depend on that. The explanatory memorandum notes that utility networks include the electricity, gas, electronic communications and district heating network, and public water supply and sewerage facilities. In a case when the use of the land according to its intended purpose is significantly restricted due to the obligation to tolerate utility networks, the actual extent of the restriction is 100 per cent. If it is partially possible to use the land, the actual extent of the restriction is 50 per cent. If the use of the land is not significantly hindered and the utility network is necessary for using the land, the actual extent of the restriction is 0 per cent, meaning that no payment for tolerating is paid for such a restriction. The current practice regarding the payment of payments for toleration is variable depending on the owner of works. Besides, in most of the cases only land tax is compensated for, and loss of profit is not taken into account. In 2012 the Supreme Court declared the current payments for tolerating utility networks to be in conflict with the Constitution. The Bill on Amendments to the Code of Civil Procedure and Other Acts (implementation of Regulation (EU) No 655/2014 of the European Parliament and of the Council establishing a European Account Preservation Order procedure to facilitate cross-border debt recovery in civil and commercial matters, and creation of a procedure arising from Protocol No. 16 to the Convention for the Protection of Human Rights and Fundamental Freedoms) (404 SE), initiated by the Government. The Bill will create a regulation for national implementation of the European Account Preservation Order which will facilitate cross-border debt recovery in civil and commercial matters and the preservation of debtor’s bank accounts located in the EU. Only funds held in bank accounts can be preserved, but a preservation order does not enable to pay out money to the creditor. Bailiffs will have to begin to enforce European Account Preservation Orders immediately. The explanatory memorandum notes that it is impossible to rely on practice when estimating the number of European Account Preservation Orders. According to preliminary forecast, county courts will receive around ten applications for a Preservation Order in a year, and bailiffs will receive approximately the same amount of applications for a Preservation Order from other Member States. The Bill will create the possibility for the Supreme Court to obtain an opinion from the European Court of Human Rights (ECtHR) before making a decision. It will be possible to request the ECtHR to give opinions on questions of principle relating to the interpretation or application of the rights and freedoms defined in the Convention for the Protection of Human Rights and Fundamental Freedoms. This possibility will make the proceedings in the Supreme Court smoother and improve legal certainty and clarity, and the human rights of parties to the proceedings will be better protected then. At the same time, an advisory opinion of the European Court of Human Rights does not hinder any party to the proceedings from later using their right to file an individual appeal. 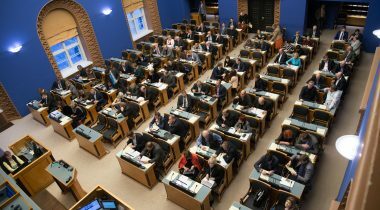 On the motion of the Constitutional Committee, the Riigikogu rejected at the first reading the Bill on Amendments to the Administrative Reform Act (393 SE), initiated by the Estonian Free Party Faction. It provided that, in the course of the proceedings for changing the administrative-territorial organisation of rural municipalities and cities, the relevant administrative borders would be changed pursuant to subsection 71 (3) of the Territory of Estonia Administrative Division Act, if as result of a poll or an initiative of the residents it appears that they wish the affiliation of a part of territory to be transferred from one local government to another, bordering local government. The result of voting: 46 in favour, 15 against. The Bill was dropped from the proceedings. The sitting ended at 5.30 p.m.